time, so I was happy to make the five-hour drive. My attempt to paddle it last year had been throttled due to heavy rains that resulted in closed access at the Falls. Apparently, the waters had gotten so high and so fast that the paddle from the Falls to town, which typically takes about three hours, had some locals back in town in less than two! So, wisely, this year, I called the State prior to making the journey to confirm that there would be access. (Florida Water Commission, 904-359-3883) I later discovered that the Suwannee River Water Management District has a great website that monitors water levels and closings. 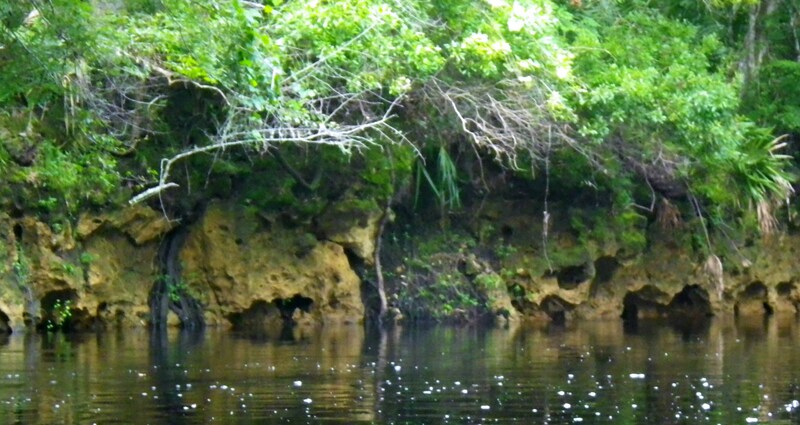 The Steinhatchee River (Native Americans named it “esteen hatchee” which means“river of man”) originates in Mallory Swamp in Lafayette County, and as it travels southwest to eventually empty into Deadman’s Bay, it picks up water from various springs (including Steinhatchee Springs) and creeks along the way. At one point—at US 19—it even goes underground when it flows into a sink, and it re-emerges about a half mile later—a couple miles above the Falls. paddling alone?” When I nodded, she added, “What if you flip? Who will help you?” I quickly double checked my straps. I climbed in my kayak and paddled away from the shore, relishing the peaceful tranquility the river always brings. For the first hour or so, I paddled a quiet, wild river, cypress and oaks providing me with refreshing shade. Limestone ledges hung over the water, etched by the water movement over many years. Large roots like long arms reached out from low banks and curved down towards the water. Birds called to each other from the woods, preferring its cool darkness to the hot sun. I hung my feet over the sides of the kayak and let them dangle in the cool, dark waters. Midway through my paddle, the landscape began to change as old wood-framed cottages appeared, mostly on the north bank. Just as I spotted my first “watch for manatee” sign, the river took on an estuarine quality, and was now bordered by lilies, tall sea grasses, leather ferns, and sea grapes. This wider river offered little shade for a summertime paddle. As I neared the Landings Resort, more private residences, docks and marinas appeared on the banks. In the end, I managed to stay upright throughout the seven-mile paddle; the river really wasn’t all that fast. It took me just over three hours with a couple short side trips on small creeks that entered the river. I made it back long before the rains came. LOL. That’s great, Sallie. Now, I’ll be hearing that in the back of my head whenever I paddle! My name is Steven Dopp and I serve as staff to The Original Florida Tourism Task Force (dba Visit Naturla North Florida). The Task Force is a 14-county destination marketing organization promoting nature-based tourism in north central Florida. 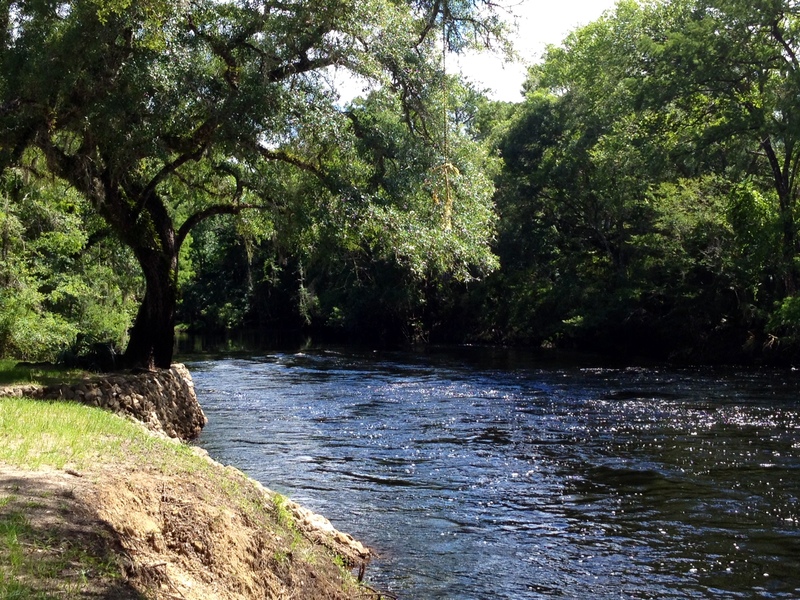 I am requesting permission to use your photo of the Steinhatchee River titled, “High Waters at the Steinhatchee Falls” on the Steinhatchee River page of the Task Force website (https://www.naturalnorthflorida.com/things-to-do/steinhatchee-river/). I absolutely approve. I am happy to help bring attention to Florida’s beautiful rivers anyway I can. Feel free to use any of them. Thank you. I will do so. I tried using the referenced photo. Unfortunately, it doesn’t seem to fit as well as I had hoped in the available space. I will try again.. It may be that I made it smaller when I posted on the website. I could always email it to you if you want. Just let me know. I cropped it a bit and I think it now fits the space better. See for yourself! I also used your Withlacoochee North photo.